While other British settler societies – Australia, Canada, the US and South Africa – have states or provinces, New Zealand is a unitary state. Yet New Zealanders today hold firm provincial identities, dating from the time when the young colony was divided into provinces: 1853 to 1876. Why were the provinces created? How did settlers shape and change their institutions? And why, just over 20 years later, did New Zealand abolish its provincial governments? 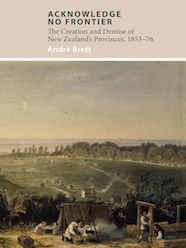 Acknowledge No Frontier, by André Brett, is a lively and insightful investigation into a crucial and formative part of New Zealand’s history. It examines the flaws within the system and how these allowed the central government to use public works – especially railways – to gain popular support for abolition of the provinces. The provincial period has an enduring legacy. This is the surprising and counterintuitive story of how vociferous parochialism and self-interest brought New Zealanders together.